Sometimes we just need to get away from the chaos in the world. For me that means away from people and into nature and quiet. 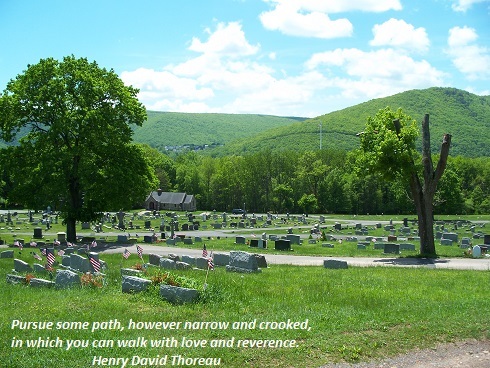 It may be odd, but one of those places is the Evergreen Cemetery in Jim Thorpe (see picture). At this location, there’s rarely anyone around, although I have run into a flock of turkey passing through. The view shows the Flagstaff Mountain, Mt. Pisgah and what may be part of the Broad Mountain. Excursions to this sanctuary allow me to reminisce, to forget the chaos and to regroup. They give me time to think about what’s really important. After all, no one near me here has that luxury anymore. Take a break. Find a place to soak in the energy and the beauty of nature. Take a walk and appreciate the path you’ve chosen.